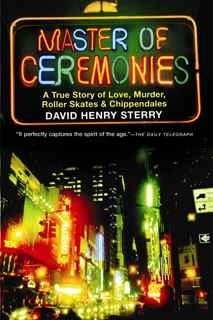 David Henry Sterry’sMaster of Ceremonies: A True Story of Love, Murder, Roller Skates & Chippedales is written with punch, heart, and so much energy, that there’s a virtual jolt on every page. Sterry tells the story of how, during the 80s, as a green, new-to-NYC actor, he finally found a job– as Master of Ceremonies at Chippendales, of all places, a glamorously sleazy gig which didn’t sour until the brutal murder of his boss. From Brooke Shield’s party to behind-the-scenes glimpses at the “men of Chippendales” and the women who hoot and holler at them, Sterry chronicles a world that is as seedy as it is fascinating. A tough-talking book with a tender heart, Master of Ceremonies is moving, real, and a whole lot of fun.